Is it just me, or are most guys impossible to shop for? If you feel me, you’ll be glad to know that this year I’ve put together a very specific gift guide…entirely dedicated to travel gifts for men! Whether it’s my husband, my dad, my brothers or a male friend….whenever the holidays roll around, I find myself completely clueless as to what to buy. But if you’ve got any trips coming up in the next year, then sticking to a travel theme for gift-giving is a really easy way to cross things off your shopping list. Bonus tip: one of these gifts, plus tickets or reservations to an activity that he’ll love during his next trip would make for an amazing present! Most guys I know NEVER buy personal travel essentials for themselves. All of the personal basics in my guide have a little bit of luxe, too, so they are perfect for gift-giving! Dopp kit – They make them so chic these days! I sorta want this one! Carry on Cocktail Kit – This is just one of those gifts that it’s impossible not to smile when opening. I dare you to try. For more about it, check out this post. You might also like the champagne version for yourself. Mini toiletry kit – My husband hates transferring all of his liquids into travel-size containers. So this year, I’m going to get him one of these! Travel shaving kit – A little luxury for next time he’s on the road, and wants to stay clean-cut. These days, everybody’s suitcases are stuffed with electronics, which are the modern day version of travel essentials, seemingly. Keep up with the trend and get him something that he’ll rely on every time he travels. Travel Gadget + Cord Organizer – Keep it al organized and together with a travel-size gadget and cord organizer. I have one, too, and if it ever looks a little sparse while I’m packing, it has the extra benefit of helping to remind me if I’ve forgotten something. Wireless Headphones – Someone gave me the non-wireless versions of these as a gift, before the wireless ones were available. I love them SO MUCH. They only thing I kept thinking was….I wish these came in wireless. Well, now they do! And they make a really, really nice gift. Travel speaker – I love this one because, honestly, I don’t think they can pack any better sound quality into anything smaller! This speaker is literally the size of two quarters stacked on top of one another, so it’ll take up hardly any space in a bag…meaning that it can come anywhere with you! Travel iPhone tripod – There’s nothing more attractive than a man with a selfie stick….said no one, ever. So ensure he’ll never be THAT GUY, and hook him up with a tripod, instead. These are the things that are hard for him to travel without! In some cases, a dude might already have something similar, but an upgrade is something he’d never do for himself. Backpack – I’m willing to bet that he’s already got one laying around…but I’m also willing to bet that it’s time for an upgrade from the old college days. This backpack is high-quality, good value, and the perfect accessory for any trip! Weekender Bag – Ever so slightly more grown-up than his gym bag….and 100% perfect for all of those weekend trips that you’re looking forward to next year! 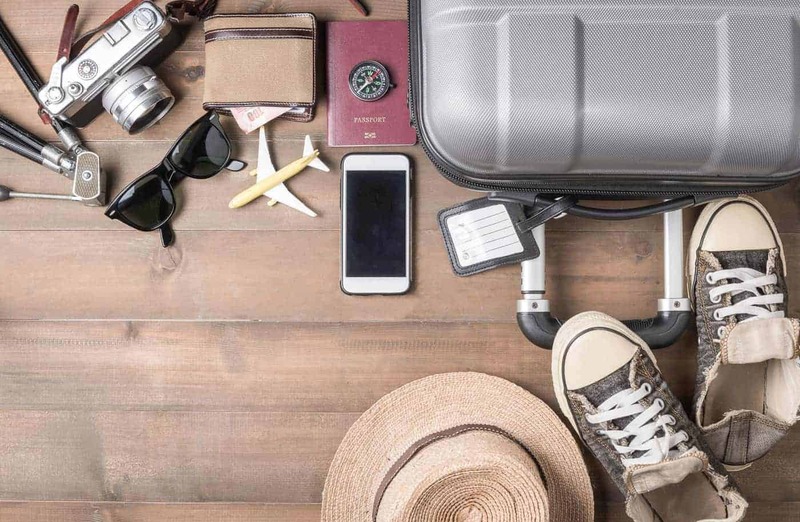 Carry On Suitcase – You can’t get much more basic when it comes to a travel gift….but a good carry on suitcase is one of those things that a dude will probably never buy for himself. So it makes for the perfect gift! Passport case – Because it’s the little things in life. Travel wallet – Is his everyday wallet overflowing with Best Buy gift cards? Make it simple for him to pare it back to the basics with a right-sized travel wallet. This one is made to fit in a front pocket to prevent pickpocketing, and it’s also RFID-blocking, so it’ll prevent creepy info-swipers from stealing credit card numbers. 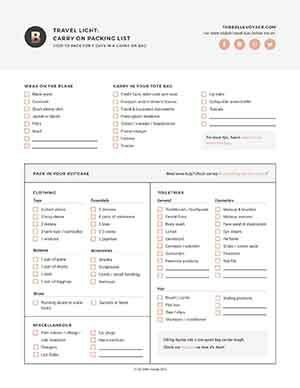 Packing Cubes – Unless your dude is uber-organized, I’m betting he could use some help when it comes to packing. These cubes make it easy-peasy to not only pack, but also find what you’re looking for once you’re away from home. No more lost boxer shorts. Compression travel socks – Yes, I’m suggesting that you put stockings in a stocking. Why? Welp, these are comfy, won’t bunch up, and they help to prevent DVT while flying. Say no more! Men’s dry shampoo – Turns out that guys might not be the only ones who don’t enjoy washing their hair while traveling. Travel electronics charger – I love this one not just for how quickly it will charge your device, but mostly because it has TWO ports for charging. So hopefully he will share. Eye mask with built-in headphones – Yep, you read that correctly. This is the perfect travel eye mask for guys who like to fall asleep listening to music. And who wouldn’t? Looking for Travel Gifts for Her? Check out my beauty gift guide, as well as some of my recent stylish travel finds!